Old and new TTC streetcars rode the rails together at the Beaches Easter Parade. SPOTTED BY: dtstuff9, from the Torontoist Flickr pool. WHERE: Toronto Beaches Lions Easter Parade, which ran along Queen Street East from Neville Loop to Woodbine Avenue. WHEN: Sunday, April 20, 2 p.m.
WHAT: The streetcar model we are all currently familiar with, accompanied by a Peter Witt streetcar (which operated here from 1921 until 1963), a Presidents’ Conference Committee streetcar (which dominated the TTC’s streetcar fleet from 1938 until 1995), and one of the TTC’s brand-new low-floor streetcars, which will begin service August 31 on the 510 Spadina route. 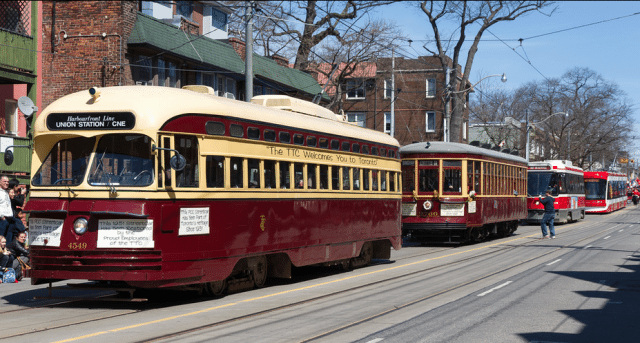 The parade marked the first time all four types of streetcar had coasted along anywhere together. CORRECTION: April 21, 2013, 10:40 AM This post originally stated that the parade occurred on Monday, April 20; in fact, it took place on Sunday, April 20.